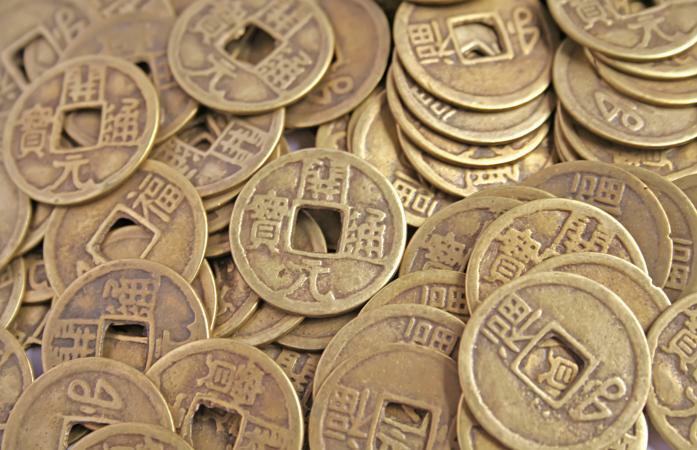 Antique or replica, Chinese feng shui coins are a traditional symbol for wealth. A cluster or string of them in an auspicious location can boost positive chi and prosperity in your business or home. Coins used in feng shui are Chinese metal money, usually copied from the official currency of the Qing dynasty, China's longest and last dynastic rule. The Qing emperors were in power from 1644 to 1911, a time of unprecedented prosperity and relative peace for China. Each emperor minted his own coins, made of bronze, copper, or brass (rarely gold or silver), many in the shape of a circle punctuated by a square cut-out. The round shape signified heaven and the square opening symbolized earth. The fronts of the coins, the yang side, are inscribed with four characters, flanking the four sides of the opening. This is the side that should always face out when the coins are used for feng shui. The back of each coin, the yin side, has two characters or may be blank. Yang characters denote the dynasty and the sentiment of the emperor -- common calligraphy words are peace, prosperity, and protection. It's fine to use replica coins for feng shui; used or antique coins should be "cleansed" before setting them in position. One way to clear old energy from the coins is to set them in the sunlight or the moonlight for a full day or night. Another energy cleanse is to wash them with water in which crystals have been soaked. Keep newly minted replica coins or genuine antique coins dusted so their attraction to positive energy remains strong. Gold colored replica coins (gold over baser metal) have the same feng shui symbolism as the duller metals. The metal itself is what's important. The strong metal element holds prosperity and protection energy; resin or plastic lucky coins are not appropriate feng shui cures. The best coin cures are grouped in threes - a linked string or cluster of three, six or nine coins. Three is the trinity symbol for blessings or luck for heaven, earth, and people. Six, a multiple of lucky three, means heavenly energy. Nine is the number of completion - the last single digit before the numbers begin again with 1 - 0. Feng shui coins are typically connected with red ribbon or cord, red being the most high-energy, auspicious color and a prosperity symbol. Look for coins gathered with fancy mystic or flower knots, an additional lure for luck. Strings of coins often feature a hanging tassel which may be connected to the coins with a decorative knot or gem-stone bead. Any combination of threes will work -- choose what suits the area where you intend to hang or hide the coins. 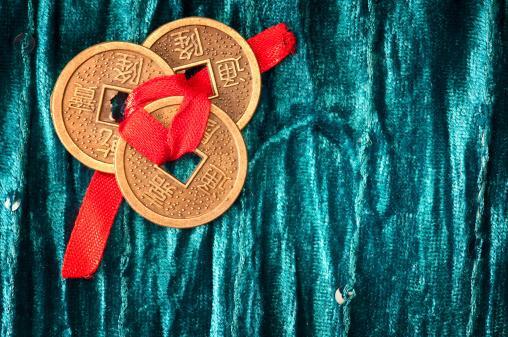 It's obvious that lucky coins displayed in the wealth corner of your space (according to the bagua map) will multiply the good energy there and attract prosperity to your home or business. But you don't have to confine the beautiful coin charms to one area. Slip a knotted triangle of lucky coins into your desk drawer. Tuck coins under the blotter of your desk or the rug inside the front door. Wear a single coin or cluster of three coins as a medallion around your neck. Hang a feng shui coin key chain from your dashboard mirror, your backpack or your actual keys. Carry a coin as an amulet in your pocket or wallet. Place a single coin in each of four lucky red envelopes, one for each corner of a room. Suspend a string of knotted coins next to or over your cash register. Wherever you feel the need for a shot of metal element prosperity energy, consider adding one or more feng shui coins. Jin Chan, the golden toad, three-legged toad, or money frog, is said to appear at the full moon near a house or business that will soon enjoy an influx of wealth. The frog is a figure from a Taoist tale of a greedy wife who tried to steal the Elixir of Immortality. She was turned into a three-legged amphibian and banished to the moon where she wandered nightly, coins and money sticking to her due to her greedy nature. In the morning, when the frog/toad returned home, it would be covered in money. So placing a three-legged frog in your home or business will attract money and cause it to stick to you. 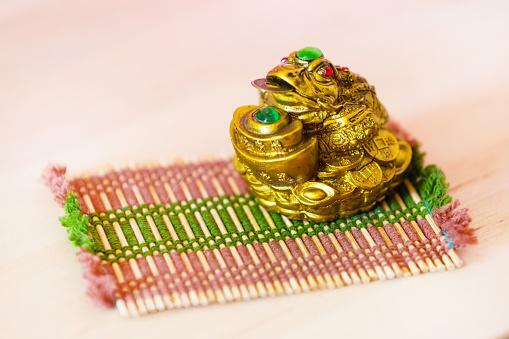 A coin or string of gold coins will lure the money frog -- placing a lucky coin in the open mouth of the frog completes the feng shui magic. A Jin Chan money frog by the front door invites good fortune inside. Never place it on the floor and always face the frog in the direction that you want money to flow (into, not out of, your house). It's wonderful to receive a gift of lucky coins but you don't have to wait for that. Many online retailers of feng shui products carry the coins and you can purchase them singly, strand by strand or in large lots (useful if you are embedding them in a pathway to your door or scattering them under a large area rug). Find decorative lucky coins in Chinatowns and Asian shops in larger cities, especially around the Lunar New Year. 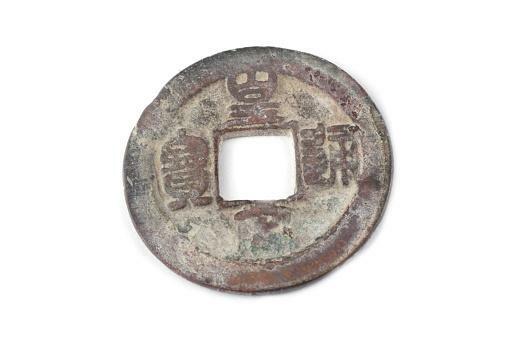 Hunt for local antique dealers who may have authentic Qing dynasty coins, if you are a collector. Amazon lists numerous vendors with prices from .75 for three coins on a red thread to around $10 for a fancy knotted string. Bags of loose replica coins range up to about $14. FengshuiMall.com offers a wide selection of coins and ingots. Look for gold and brass coins in sets of three for around $10. Larger charms, such as a coin sword or tassel wealth charms, can cost around $20. My Feng Shui Store has a smaller selection, but you don't have to look through pages of results to pick up a basic set of 10 coins (around $10). They also have a few tassel charms and groups of three for about $10 as well. Lucky coins are attractive feng shui charms and cures that can be used in a number of ways to encourage wealth energy and good fortune. Count your blessings in groups of three and spread the wealth around. Gift your kids with a lucky coin in a red envelope as a Chinese New Year tradition. When placing the coins, be sure the appearance and location look and feel right to you, to maximize the welcoming of good energy. And don't forget to feed your money frog. A fat three-legged frog with a coin stuffed in its mouth is a happy harbinger of prosperity and a reminder to be thankful for abundance.